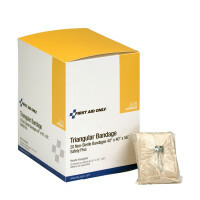 First-Aid-Product.com: Triangular Slings & Triangular Bandages (Cravat Bandages) - $AVE - Triangle Sling Swath or Bind with these muslin Triangle Slings! Cravat Bandages (Triangular Sling / Bandages) - a First Aid Essential! 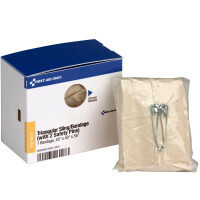 with two Safety Pins- Individual, boxed and bulk... Wholesale Direct to the Public. 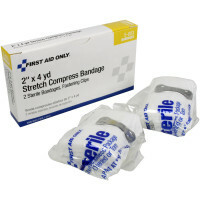 One of the most basic and versatile first aid supply requirements this product has almost as many names as it has uses! Called a Triangle Sling, Triangle Swathe, Triangle Bandage, also referred to as Triangular Dressing, Triangular Bandage and variations thereof - While primarily used to bind and supports splints and injured body parts, there are a myriad of other uses for a Triangular bandage, so we've made a list of just a few we've learned during out 20+ years of First Aid at the bottom of this page. Triangle Bandage, Triangle Sling, Triangle Dressing, Triangle Swathe - the most versatile of first aid items! What can you use a Triangle Sling or Bandage for??? 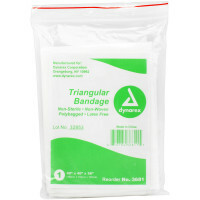 Considered one of the most versatile bandages, a triangular bandage is usually made out of muslin cloth. Triangular bandages are used for maintaining compressions or poultices on a head wound. They may be used for keeping body parts, such as shoulders, stationary during the healing process as well. Chest wound dressings may be kept in place with triangular bandages, too. Splinting broken bones, holding gauze in place, and stopping or preventing bleeding are other uses. Because of all of these uses and potentially more, a triangular bandage is considered a staple in most first aid kits. If a victim has an injured arm, a triangular bandage can be used as a sling, to support the arm in a bent position over the chest. A second cravat (folded as a long band) can be used around the torso as a swathe, to immobilize the arm against the chest. This technique is called a sling and swathe. 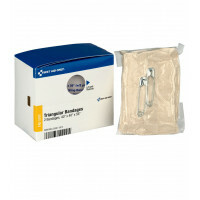 Dedicated sling and swathe kits are available for purchase. But the advantage of the triangular bandage is that a few compact bandages serve multiple purposes. This allows a smaller first aid kit to do more. If a victim has a broken leg, the leg can be immobilized with a blanket between the legs and a couple of cravats to tie the legs together, firmly but not so tight as to restrict circulation. If a victim has a sprained ankle or wrist, a cravat can be used like an Ace bandage to wrap and support the appendage. Always remember, when wrapping, bandaging, or taping any wound, to avoid restricting circulation. In the case of a head wound, a triangular bandage can be wrapped over the forehead and around the top of the head to cover the wound. Do not use bandages over the eyes, nose, or mouth. Do not use bandages of any kind around the neck, because you might restrict circulation to the head. Also known as a cravat bandage, a triangular bandage is a piece of cloth put into a right-angled triangle, and often provided with safety pins to secure it in place. It can be used fully unrolled as a sling, folded as a normal bandage, or for specialized applications, as on the head. One advantage of this type of bandage is that it can be makeshift and made from a fabric scrap or a piece of a t-shirt. The Boy Scouts popularized use of this bandage in many of their first aid lessons, as a part of the uniform is a "neckerchief" that can easily be folded to form a cravat.